Carefree offers a full line of residential and commercial garage door service/repair work, repairing a variety of garage doors and garage door operators / openers. We stock a full line of garage door springs, hardware, and many operator parts. 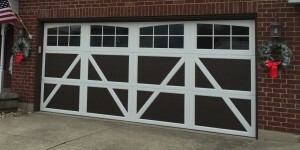 We install only the highest quality Haas, Hormann, and Amarr Doors. Are you concerned about high winds during a tropical storm or hurricane at the beach? We can get your door ready by adding hurricane struts and hardware. We handle most all service within 24 hours. Contact us for all your service needs.